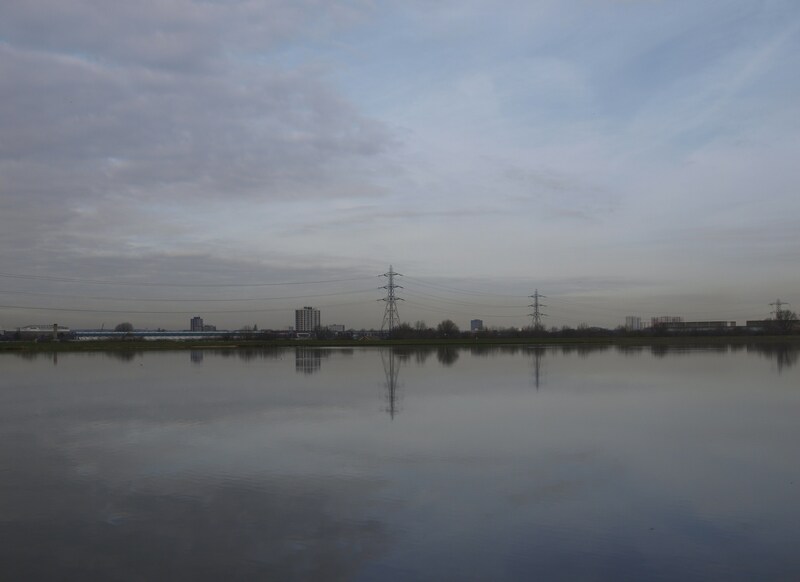 On Saturday I spent a sunny morning with the lovely folk of the London Bird Group (part of the LNHS) out at Walthamstow reservoirs, looking at female ducks. Why female ducks, specifically? Because they are much duller than the showy males, and are often overlooked. They are also sometimes harder to identify due to their drabness, especially from a distance. The first ducks we saw were pochard. The males have grey bodies and very distinctive bright red heads, while the females are a much more muted grey-brown mottled colour. We also had the privilege to spot teal, goldeneye, goosander, gadwall (at a great distance! ), tufted duck, and of course the ubiquitous mallards. Except that there was something different about some of the mallards at Walthamstow…one of the first birds we saw was very dark brown, with white on its head and breast. This sparked a debate about whether it was a hybrid, or just an odd colour mutation. Later on we also saw another duck with this colouring, as well as one with the normal green head but an unusally dark brown body. I did a little Googling on the subject when I got home (as you do) and it turns out that, while mallards can and do hybridise with a whole range of other duck species, the birds we saw are actually examples of what are often referred to as ‘manky mallards’: the colourful result of wild mallards interbreeding with domestic ducks (which are the same species). This sort of thing seems to go on a lot, and it’s possible to see mallards with all sorts of interesting colouration due to genes introduced from the different breeds of domestics. We speculated that the dark brown ducks with the white bib that we saw were probably females, while the green-headed, brown-bodied bird was clearly a male. 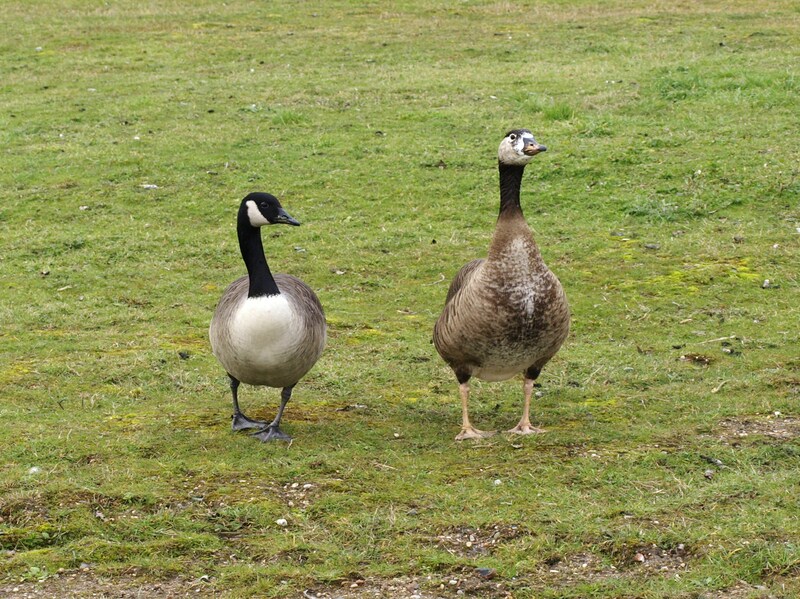 The bird on the left is a standard Canada goose. His friend on the right, however, is brown, with orange legs and an orange-black bill. He has the dark neck of a Canada goose, but clearly owes much of his colouration to a greylag parent. But, again, there’s something slightly odd here. 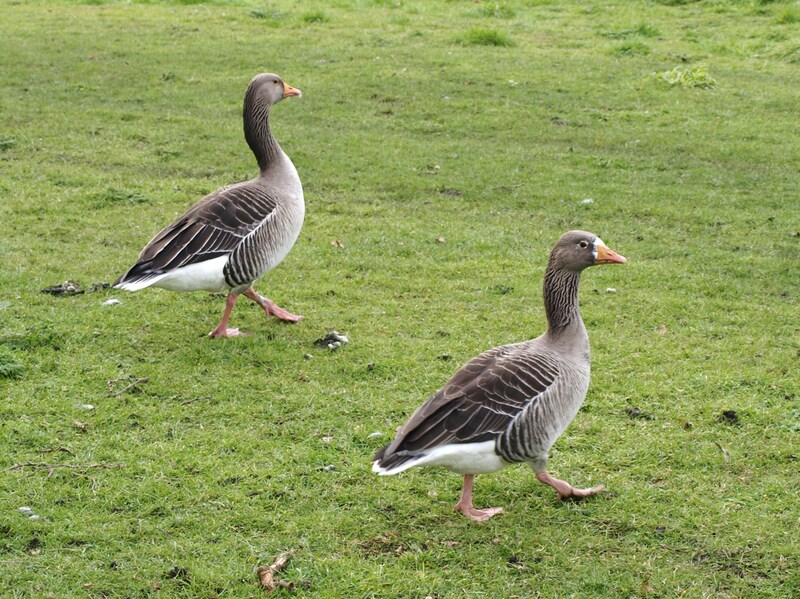 The one on the right has some white on the face and a white ring around the eye, which is absent on the normal goose to the left. It’s possible that this is a hybrid greylag x greater white-fronted goose, but then again it could just be an interesting colour morph! Without DNA from the birds it is very hard to tell which is the case. We also saw other interestingly-coloured geese that were leucistic (reduced pigmentation caused by a recessive allele), including a Canada goose with speckles of white on its head and neck, and another with an entirely white head (but we only saw it from a distance, so it could also have been a hybrid!). The walk may have begun as a guide to identifying much-ignored female ducks, but the reservoirs’ more unusual feathery residents added some extra interest to the day!